The 2019 conference will once more be held at Whittlebury Hall Hotel for three full days of intensive education across a broad range of mainframe topics on Tuesday 5 November to Thursday 7 November. Planning has commenced and we aim to have an outline agenda published here around the middle of the year. Last year's conference website can be seen here. The recorded sessions from the conference can be found at YouTube. Every year the GSE UK Conference choses 2 charities to donate raffle and prize money to. The 2018 Conference donated £1695 to the Rainbow Trust. 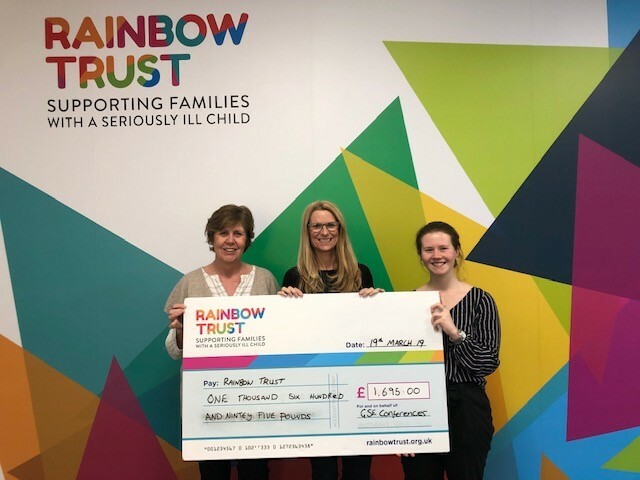 The Rainbow Trust was chosen for the wonderful work it does supporting families with a seriously ill child. GSE UK Region have received a letter of thanks and a certificate from the Rainbow Trust in appreciation of your generosity. GSE UK Members get five free places to attend the conference. This covers registration, attending the sessions, entry to the vendor exhibition, lunch and refreshment breaks throughout the conference and the conference dinner and pre-dinner drinks on Tuesday evening.